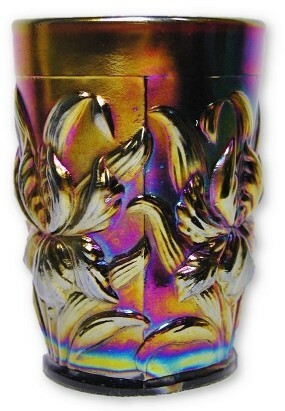 Fiery amethyst HEAVY IRIS tumbler! 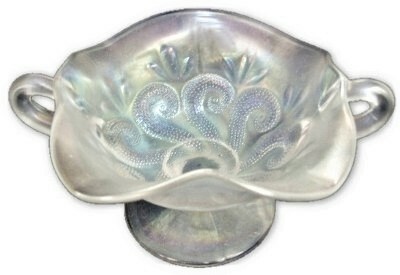 This item is very attractive and has wonderful iridescent finish is almost opaque! 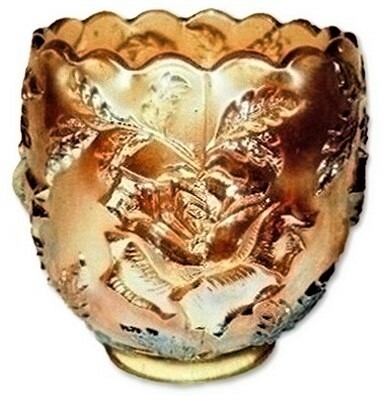 The tumbler stands 4" tall, 3" across the top and 2 1/2" across the base. No chips, cracks or repairs. 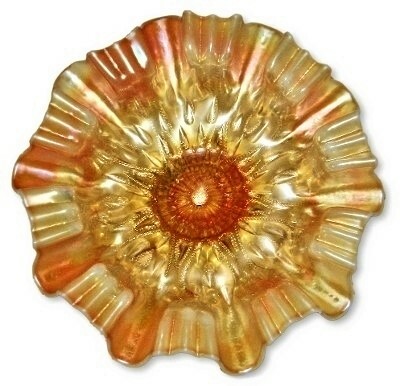 Peach opalescent, crimped and ruffled HONEYCOMB AND BEADS plate/dish. 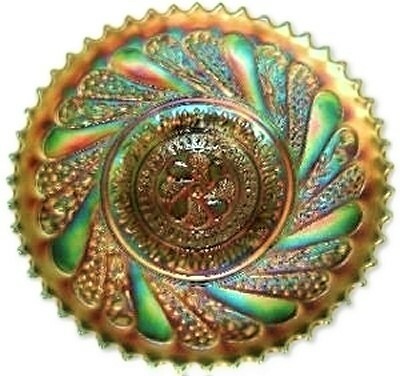 This item is a 10 out of 10 for color! Measures 7 1/2" across and 1 7/8" high. No chips, cracks or repairs. 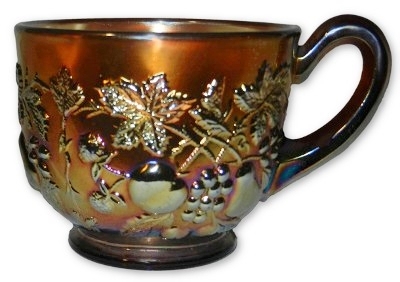 Dugan amethyst "Many Fruits" pattern punch cup. Measures 4 1/8" X 3 1/8" X 2 1/2". No chips, cracks or repairs. 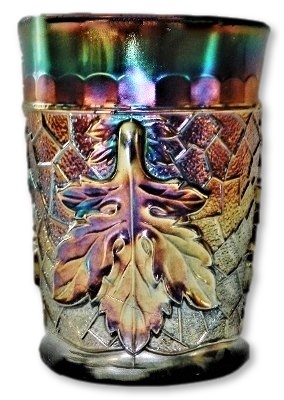 DUGAN "MAPLE LEAF" pattern blue tumbler. Measures 4 1/4" X 3". There is one tiny flea bite on the base. No other chips, cracks or repairs. 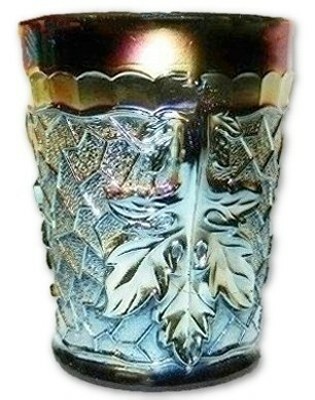 Oxblood to nearly black glass, MAPLE LEAF pattern tumbler. Measures 4" X 3". No chips, cracks or repairs. 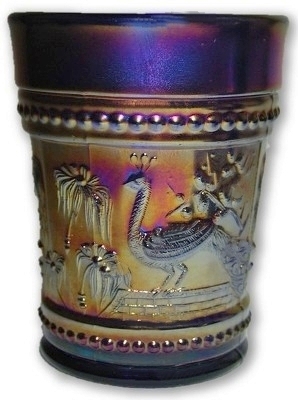 Amethyst PEACOCK AT THE FOUNTAIN tumbler. Excellent iridescent finish. Measures 4" X 3". No chips, cracks or repairs. Blue PEACOCK AT THE FOUNTAIN tumbler. 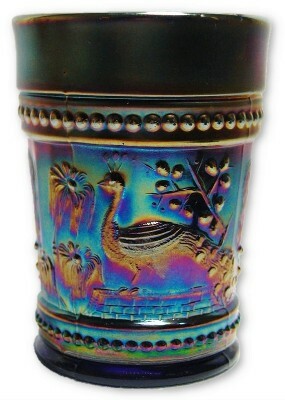 Excellent iridescent finish. Measures 4" X 3". No chips, cracks or repairs. Blue PEACOCK AT THE FOUNTAIN tumbler. 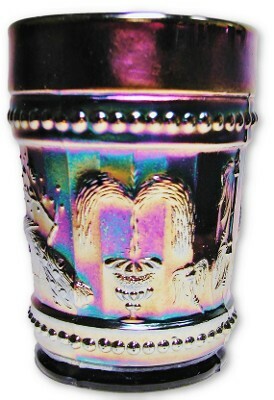 Outstanding ebony satin iridescent finish. Measures 4" X 3". No chips, cracks or repairs. Marigold PEACOCK AT THE FOUNTAIN tumbler. 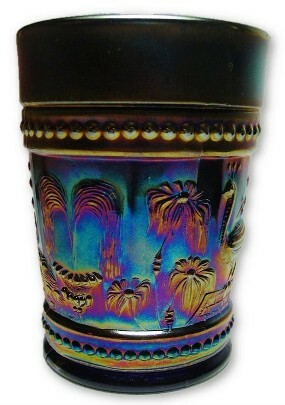 Excellent iridescent finish. Measures 4" X 2 3/4". No chips, cracks or repairs. 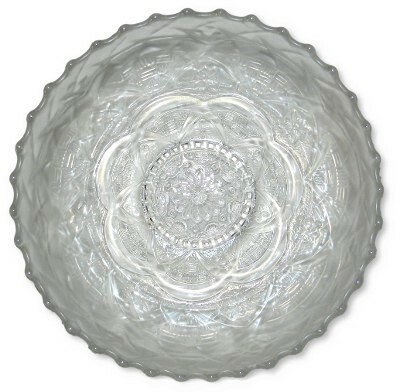 Brilliant white PERSIAN GARDEN large master ice cream shape bowl. Frosty, rainbow plethora of color is all one could ask for in any white carnival glass finish and this one has it in spades. 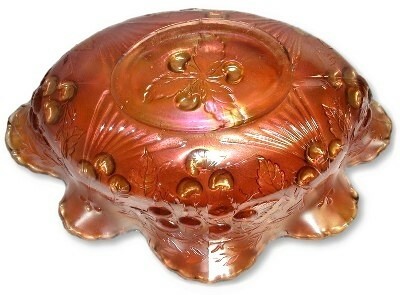 Measures 11" across and sits 2 3/4" high. The back pattern is BASKET WEAVE. No chips, cracks or repairs. 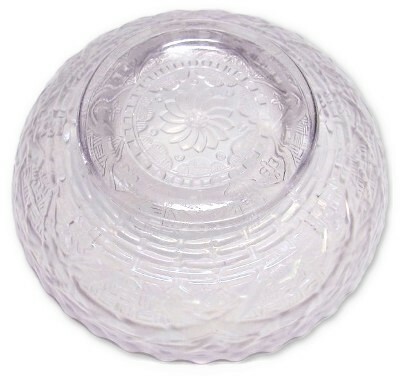 Pastel white/violet PERSIAN GARDEN 5 3/4" ice cream bowl. 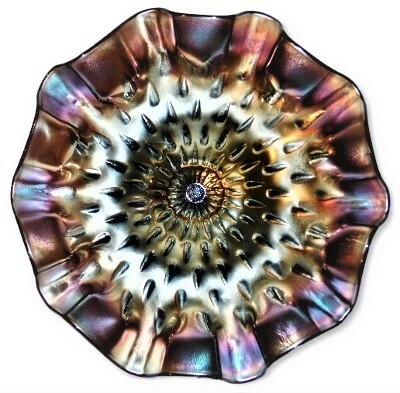 This item has an outstanding colorful iridescent finish and it is even more impressive in person. Measuring 5 3/4" X 1 1/2". 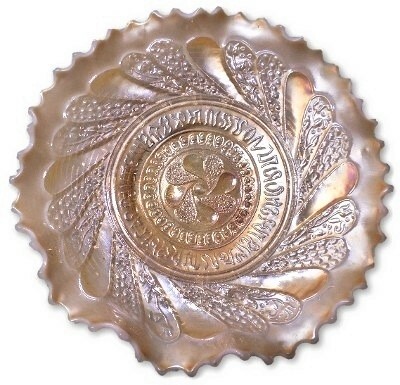 The reverse side is BASKET WEAVE. No chips, cracks or repairs. 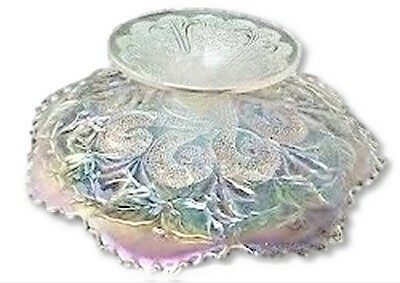 Frosty white and highly iridescent PERSIAN GARDEN small ice cream shape bowl. This item measures 6" X 2". No chips, cracks or repairs. 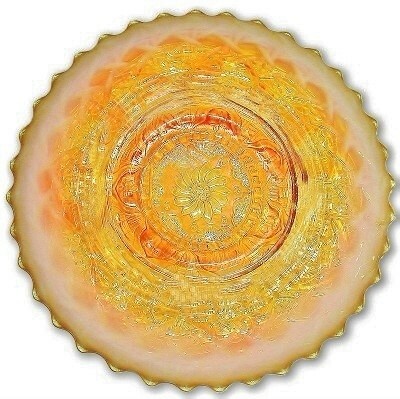 PERSIAN GARDEN peach opalescent plate. Measures 6 3/4" X 7/8". 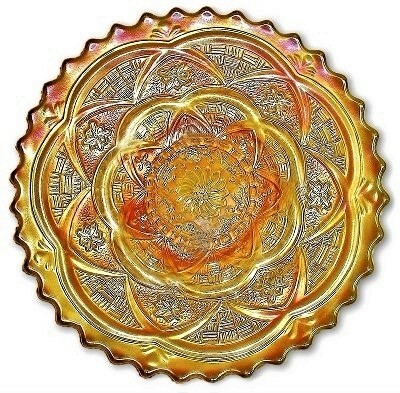 One of the most beautiful plates you will every find, this is an investment quality item. No chips, cracks or repairs. 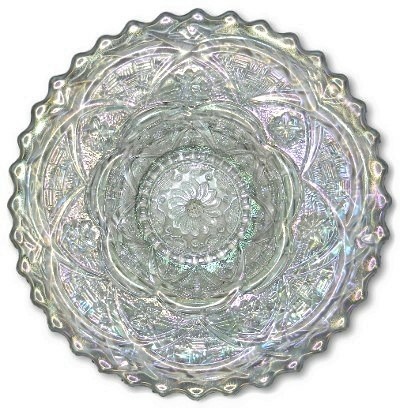 Frosty white PERSIAN GARDEN pattern plate. Measures 6 3/4" across and sitting only 3/4" high. No chips, cracks or repairs. 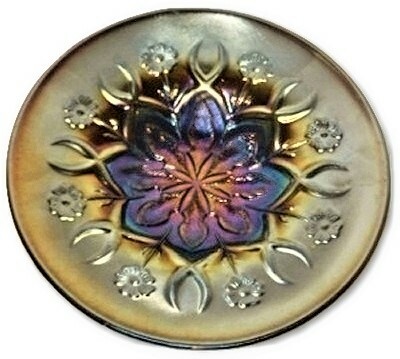 Purple PETAL and FAN crimped plate/dish. 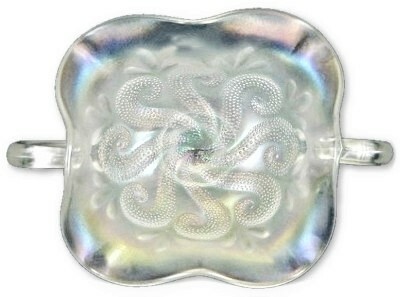 The reverse pattern of this item is JEWELED HEART. Measures 6 1/2" across and only 1 1/4" high. 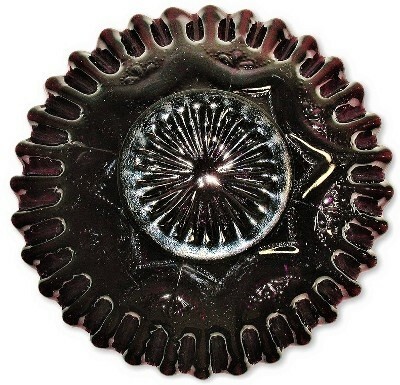 There is light stacking wear to the front and back of this item and an extremely small edge flea bite. No other chips, cracks or repairs. 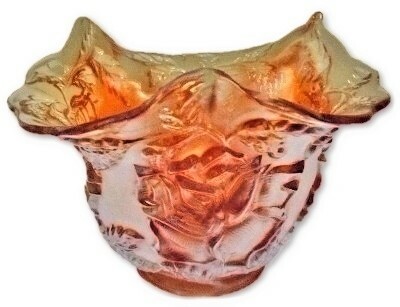 Dugan Glass Company "PEACH OPALESCENT" internal swirl patterned, tri corner and pinched side rose bowl. Measures 4 1/2" X 4". 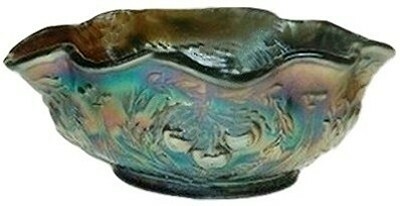 Normal interior glass pieces added as are normally found in this Art Glass-Carnival Glass transition line. No chips, cracks or repairs. 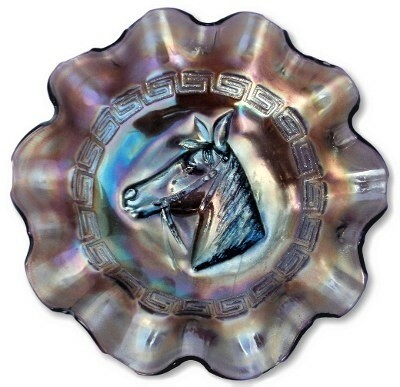 Dugan "PONY" 10 ruffled bowl in amethyst. Measures 8 1/2" X 2 1/2". No chips, cracks or repairs. 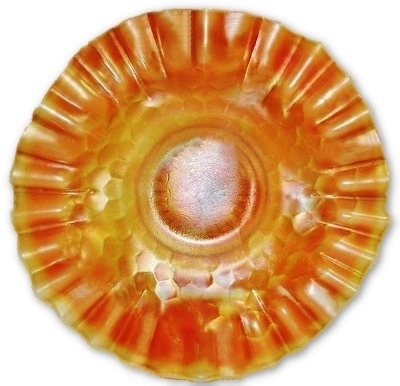 Marigold PULLED LOOP vase. Measures 11" tall and 3 1/4" across the base. 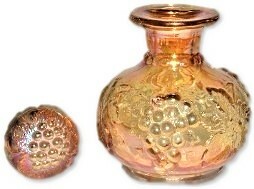 There is some light wear to the interior color and the vase. No chips, cracks or repairs. 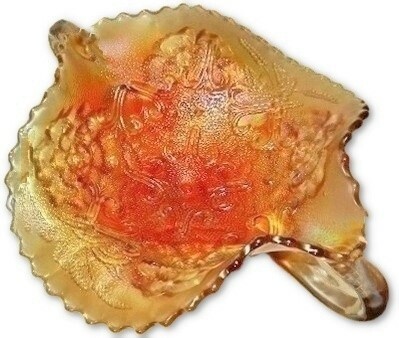 PUZZLE with FLORAL and WHEAT back pattern 2 side up banana dish shape. 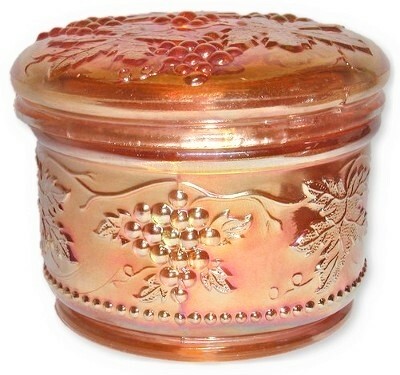 The iridescent finish is a rich marigold but what is so unusual about this example is that the base glass appears to be a pale lavender and it glows bright green when held to a black light! 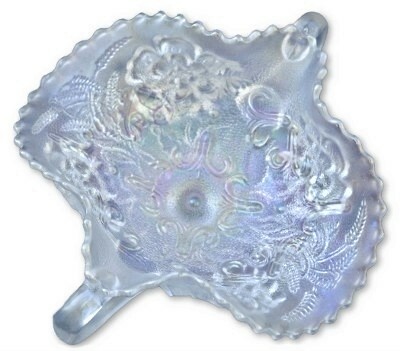 This pattern has been known to come in Lavender but we do not believe that this particular shape has been found to date in lavender or UV reactive glass. Measures 9 1/4" X 7 3/4" X 4". A very tiny manufacturing split on one point which is not post production damage. No chips, cracks or repairs. PUZZLE with FLORAL and WHEAT back pattern white 2 side up banana dish shape. Measures 9 1/4" X 7 3/4" X 4". There is an in the making small tool mark where one of the handles is applied to the body as well as a very small flake on the edge of the pedestal foot. No other chips, cracks or repairs. Frosty white QUESTION MARKS two handled footed bonbon/card tray. 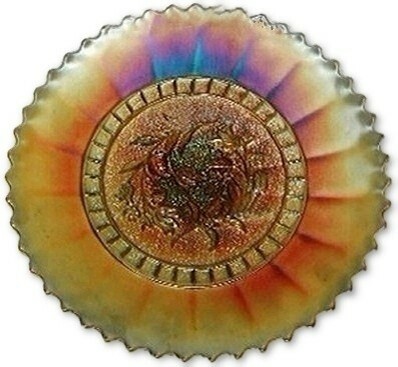 A very nice, crisp mold and frosty colorful iridescent finish. Measures 7" X 6" X 3 1/2". No chips, cracks or repairs. 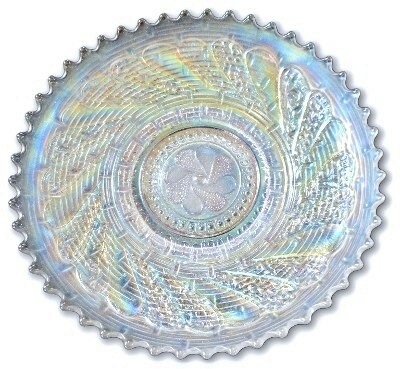 White QUESTION MARK pedestal plate with GEORGIA BELLE & PUZZLE back pattern. . 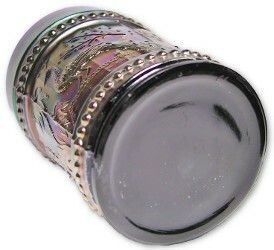 Measures 7 1/4" X 2 1/2". No chips, cracks or repairs. 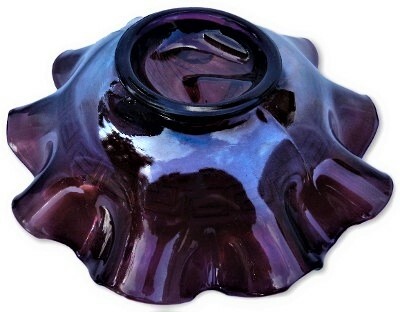 Amethyst "RAINDROPS with KEYHOLE" exterior pattern pedestal footed bowl. 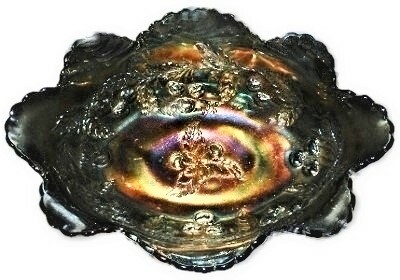 This item has Dugan's 10 ruffle edge treatment. Measures 9 1/8" across and 3 1/2" high. No chips, cracks or repairs. 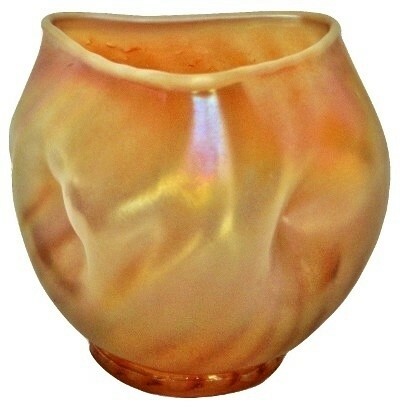 STRIKING Peach Opalescent "RAINDROPS with KEYHOLE" exterior pattern pedestal footed bowl. This item has a fantastic and very deep 3 in 1 edge. 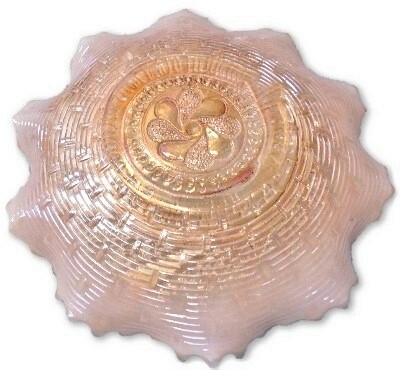 Measures 9" across and 4" high. No chips, cracks or repairs. 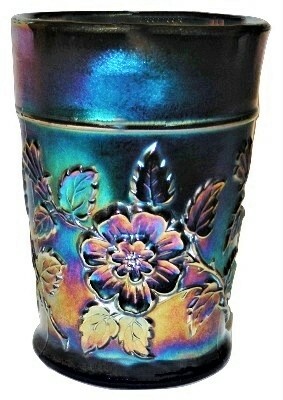 Brilliant blue RAMBLER ROSE tumbler. Excellent iridescent finish. Measures 3 7/8" X 2 7/8". No chips, cracks or repairs. 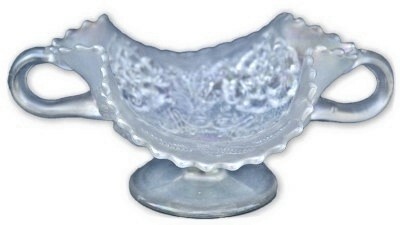 White ROUNDUP pattern ice cream shape bowl. 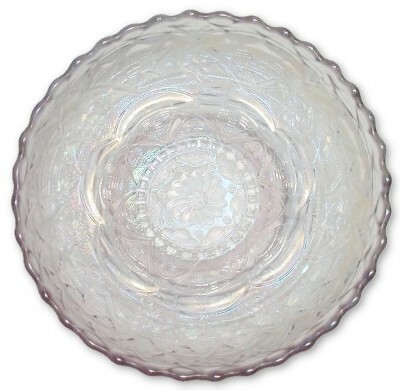 This white Roundup Dugan bowl has what we can only be describe as *ELECTRIC WHITE*. Measures 8 3/4" across No chips, cracks or repairs. 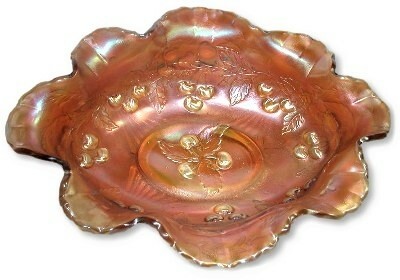 Dugan ROUNDUP pattern Pastel Peach Opalescent very low ruffled plate/dish. Measures 8 3/4" across and sits 1 3/4" high at the highest point. No chips, cracks or repairs. *SPECTACULAR* cobalt blue ROUNDUP pattern with BASKET WEAVE back pattern deep plate/dish. 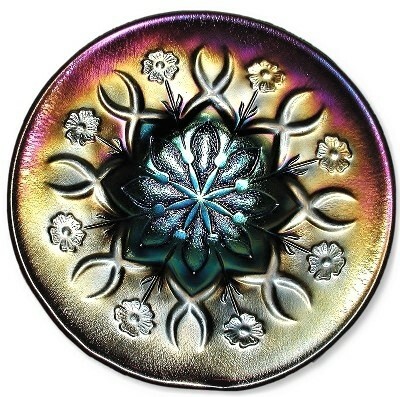 One of the finest and most stunning iridescent finishes you will ever wish for on Dugan's Roundup pattern. There is a small amount of upturn to the form but this does occur on some of Dugan's and Northwood's deep plates. Measures 8 3/4" across and 1 3/4". No chips, cracks or repairs. Blue ROUNDUP plate with BASKET WEAVE back pattern. Measures 9" across and sits 1" high. One of the pulled points has a sliver flake to the side/rear of @3/8" no other chips, cracks or repairs. 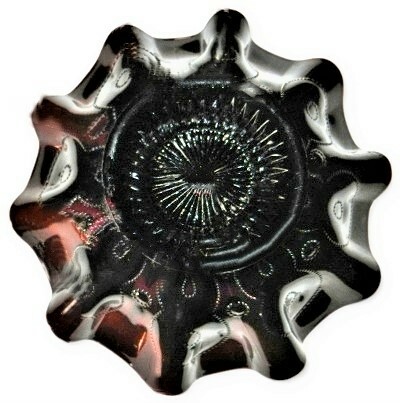 *ELECTRIC HOREHOUND* ROUNDUP plate with BASKET WEAVE back pattern. We do not throw around the word *RARE* without good reason. 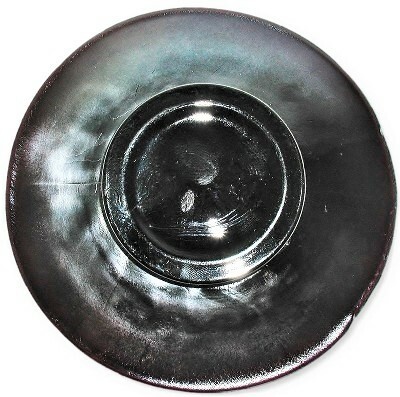 This DUGAN HOREHOUND ROUNDUP PLATE is the finest KILLER INVESTMENT QUALITY version you will ever wish to find. 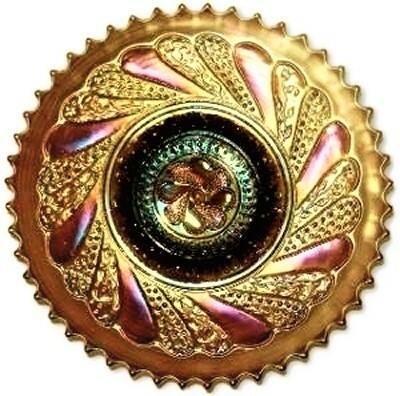 The front is covered in a magnificent frosty GOLD and FUSCHIA iridescence on the outer 1/3rd, the interior medallion is covered in BRILLIANT PEACOCK IRIDESCENCE! The back has a fine very dark transparent finish. Measures 9" X 1 3/8". 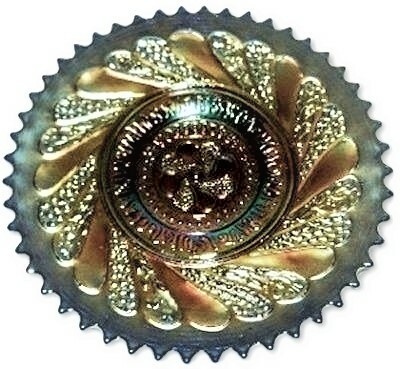 There are two extremely small and insignificant use scratches and one tiny spot of glass peak through smaller than the head of a pin which appears to have been from the manufacturing process and we are being exceedingly picky about the condition on this item. No chips, cracks or repairs. SCARCE uranium green and marigold FREE FOLD vase. 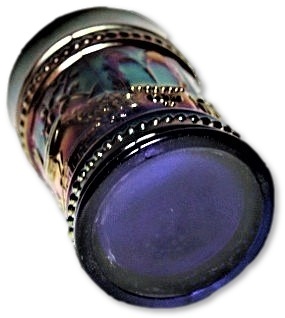 This item is very unusual for the fact that the glass glows a gently green under black light. The base measures 2 7/8" across and stands 9" tall. No chips, cracks or repairs. 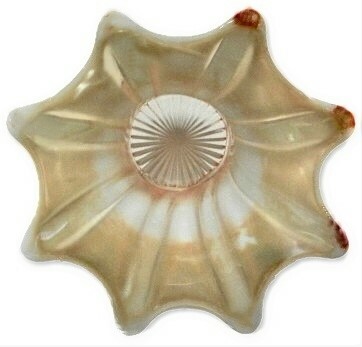 VINTAGE pattern PERFUME BOTTLE in marigold. 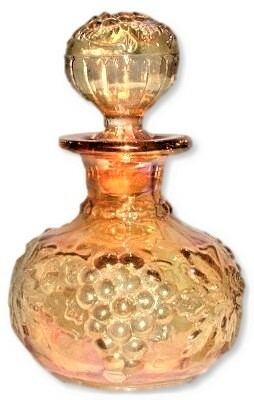 This stunning and very sought after Dugan perfume bottle measures a total of 4 3/4" tall while the stopper itself measures 2" in length. The perfume does have a little manufacturing birth marks. 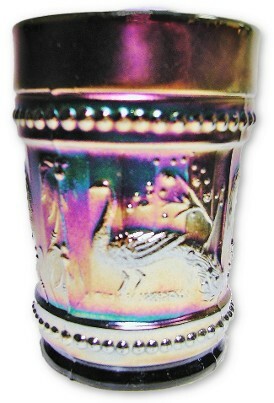 The lip of the perfume has a tiny spot of black ash embedded and one of the grapes on the body of the bottle looks to have been touched while it was still hot and is slightly flattened and a tiny but sharp but all the glass is there and it is completely covered in the original iridescent finish. 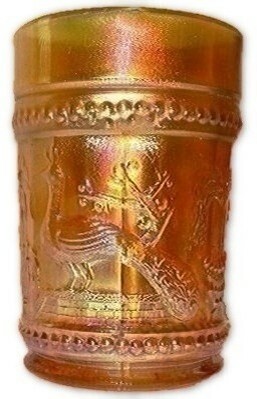 The interior of the neck of this bottle as a number of vertical scratched in tool marks from where this item must have been pulled from after having had the iridescent finish applied. No chips, cracks or repairs. 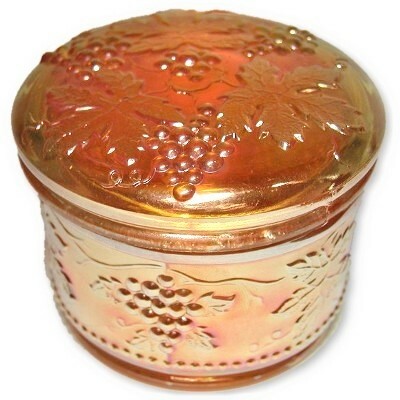 Rich and dark marigold "VINTAGE" (Grape) patter powder jar and lid. Great strike and color. Measures 3 7/8"X 3". No chips cracks or repairs. 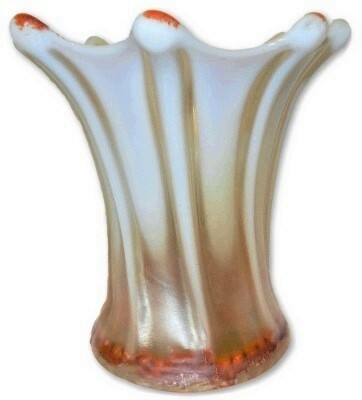 Peach opalescent WIDE RIB squatty 5 3/4" vase. Standing only 5 3/4" tall, 5 3/4" across the top and measuring 3 3/4" across the base. 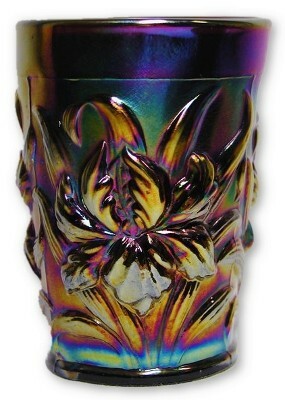 Some light wear to the iridescent finish part way down inside the vase. No chips, cracks or repairs. Cobalt blue WINDFLOWER plate. Plain back with bold and very colorful iridescent finish. Measures 9 1/4" X 1 3/8". Light wear marks to the finish. No chips, cracks or repairs. Purple WISHBONE and SPADES plate. Measures 6 1/4" across and only 1" high. 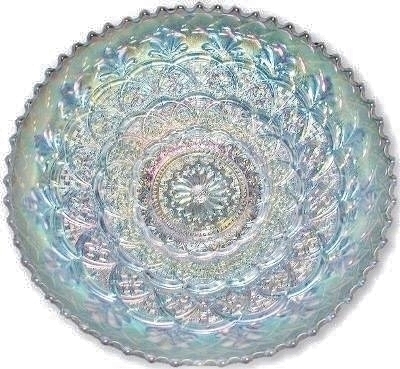 The beautiful iridescent finish is highlighted by STUNNING BLUE at the central portion of the plate. 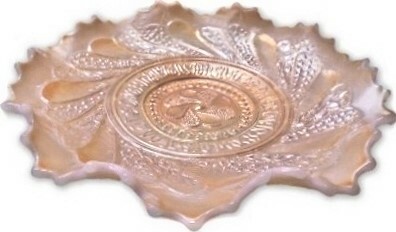 The edge of the plate is somewhat out of round. No chips, cracks or repairs. Purple WISHBONE & SPADES plate. Measures 6 1/2" across and sits 1" high. 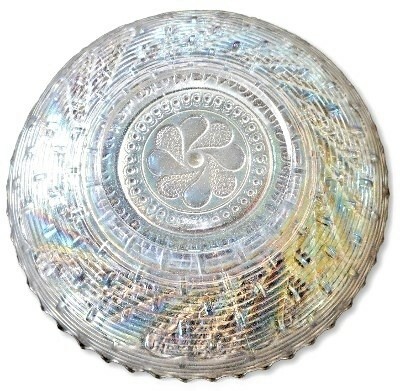 A nice pewter outer rim iridescence gives way to a lush blue/purple central iridescent finish which highlights this pattern to perfection. No chips, cracks or repairs. 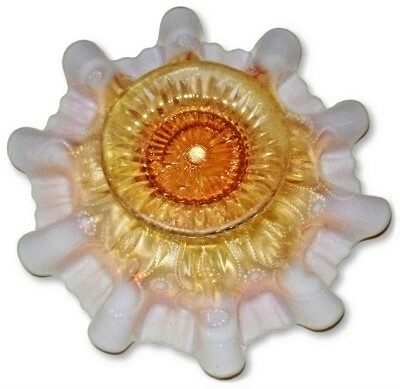 Champagne yellow "WREATH of ROSES" pattern rose bowl. 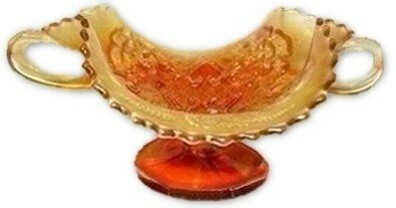 The base color of the glass is absolutely a form of yellow and not clear glass. 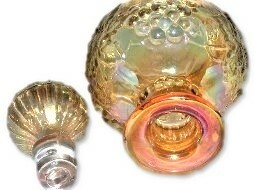 There is a sort of dull champagne iridescent finish over the yellow glass. Measures 3 3/4" X 3 1/2", No chips, cracks or repairs. 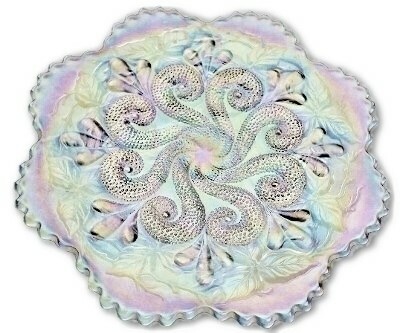 "WREATH of ROSES" pattern high pulled tri top whimsy candy dish. The base color of the glass is a very pale pink yet not dark enough to be considered Diamonds' afterglow. Measures 4" X 5". 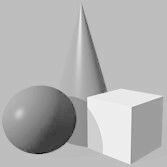 One of the points has the tiniest bit of sharpness to it, it is so minuscule that we can not see it and it is only noticed by running your finger over it several time to convince yourself it is roughness or the tiniest flea bite possible. No chips, cracks or repairs. 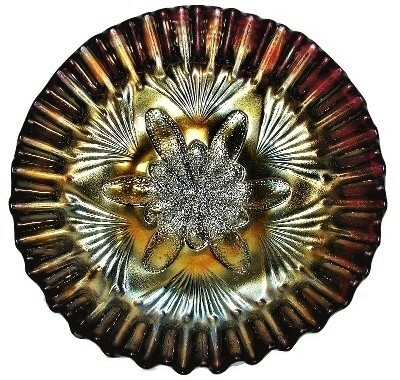 Amethyst WREATHED CHERRY master berry aka banana bowl. Measures 13" X 10 1/4" X 4". No chips, cracks or repairs. 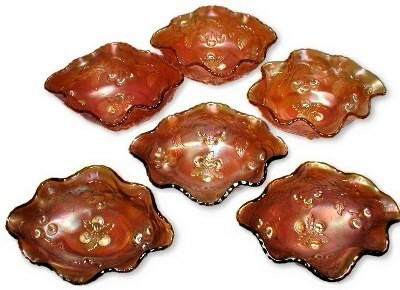 Set of six matching WREATHED CHERRY pattern pumpkin berry bowls. Each item measures 6" X 4 3/4" X 2 1/4". No chips, cracks or repairs. Pumpkin WREATHED CHERRY banana bowl/master berry bowl. Measures 13" X 4". No chips, cracks or repairs. Oxblood WREATHED CHERRY small berry bowl. Measures 5 7/8" X 4 1/4" X 2 1/2". No chips, cracks or repairs. 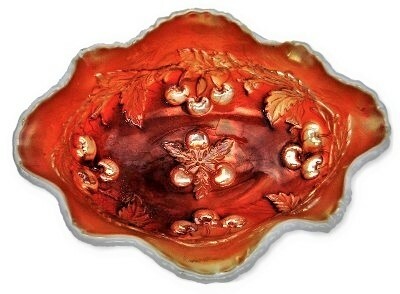 Oxblood WREATHED CHERRY large master berry bowl. When held to extremely bright light, all you will see is very dark "RED" Measures 12 1/2" X 4 1/4". No chips, cracks or repairs.